# 19 of the 52 things I learned from 52 Weeks of Worship states…”Food and Worship go hand in hand…” In this case, Bagels and Bialys joined Muslim cab drivers with a small business owner in Brooklyn. Heartwarming story. The oldest bialys store in the country is still on a roll. The sweet smell of bread will continue to waft down Coney Island Avenue, as a landmark kosher bakery in Brooklyn gets a whole new lease on life. Coney Island Bialys and Bagels, teetered and fell in September, after Steve Ross, whose grandfather began the company 91 years ago, called it quits. In a twist of history — and, one might say, a twist of bread as well — the store has been saved by two Muslim businessmen who leased the space and started a corporation under almost the identical name. They’ll keep the kosher shop’s offerings the same, preserving its history. 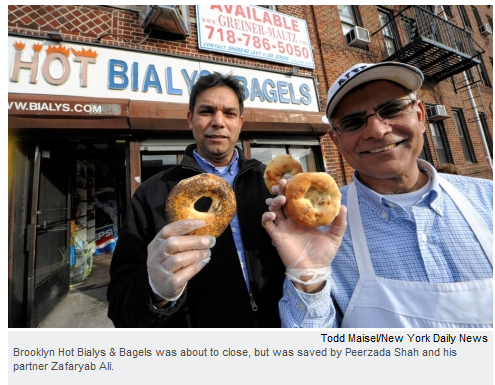 “It’s the same bialys…We are using the same recipe, too,” said Peerzada Shah, who now co-owns the business with Zafaryab Ali, who worked with Ross at the bialy shop for a decade. “We want to keep the place on track,” said Shah. And since re-opening in September, customers have regularly told the pair, “We appreciate that you’re keeping the store open,” according to Shah. Ross said the new owners were putting in long hours and looking to grow the business. Ali said he and his partner plan to build on Ross’s kosher wholesale business, which supplies bialys to Staten Island, Brooklyn and New Jersey. Other remnants of the old business have stayed as well. Jeff Edmorin, who has worked at the store for nearly ten years as a baker and at the counter has stayed on, and Joseph Jackson, a longtime store worker has helped advise the two on their new business. Ali and Shah came to bialy baking, which has historically been a family business, in a rather roundabout way. Both grew up in Pakistan and worked as taxi drivers after moving to New York. While Ali originally worked in a fruit store in Borough Park, Shah attended culinary school in Manhattan for pastry and had worked fixing ovens and other baking equipment when he lived in Pakistan. The two first got to know each other as roommates on Ocean Parkway, not terribly far from the bialy shop. The pair plans to keep the shop’s baked goods and authentic character. None of the signs have changed nor the equipment and the shop will remain kosher. But they plan to spruce the place up. Shah has already laid down new tile for the front flooring and plans to renovate other parts of the store over time. The two are also closely connected to Ross, whom they reach out to often with questions. Ross knows the bialy industry inside and out. The founder of the original store was his grandfather, Morris Rosenzweig, who came from Bialystok, Poland, the town from which bialys (savory baked dough with an indentation in the center) got their name. Rosenzweig began the company in 1920, making it the oldest in the city. Jewish culinary historian Eve Jochnowitz, said “It’s a relief” that the shop is staying open, explaining that neighborhood businesses such as this bialys store are part of two communities: the local community who shops there regularly and the larger one who makes such a store a destination. They foster informal conversations about Jewish food. While Shah and Ali may be the only Muslims to take over a Jewish bialy shop, other locales in the city have experienced similar changes of hand, most notably David’s Brisket House in Crown Heights. There’s no place like Brooklyn! This story made my day – and made me homesick for a bialy!